It’s bird time again. For a long time I have now been blogging about activities and the likes, so it’s time to show off some birds again. When I lived in Europe, I hardly ever looked at birds. Well, at least not to the point of trying to find out their names and such. It was more in the style of “Nice bird!” like many people today comment on your photos with “Nice pic!”. In the summer of 2011, I met up with a few photographers in the English Gardens in Winnipeg. There I was more or less introduced to bird photography. Starting with the ever present Chickadees, I managed to get more knowledge of some other species that were present in the Gardens. After a while, the same gardens lost a bit of their appeal as Fall and Winter came. However, Fort Whyte Alive, which is within a stone’s throw of my house (hmmm, have to throw a bit harder!) also is the home of numerous birds. So when one of the fellow photographers from the neighbourhood started to point out different birds, I think my eyes opened and I started to peer into the bushes even more. To the point where I even bought myself a bird book! This allowed me to find birds easier and in different locations, during any season. 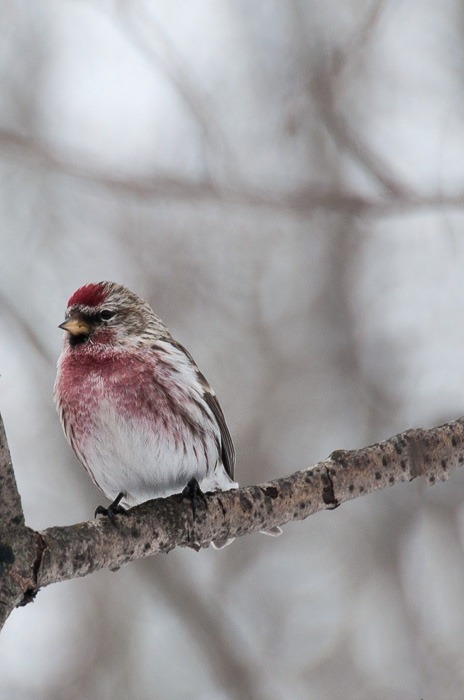 Some of the most striking little birds that are guests during the winter here are the Common Redpolls. 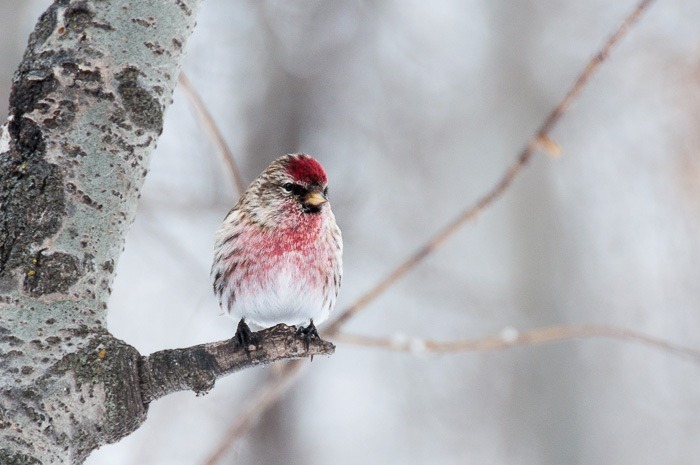 When they are breeding in winter, the males have a big red breast, going from pinkish to bright red. Last winter I found them in Fort Whyte and shot a few of them, more for the interest of “collecting” them than anything else. 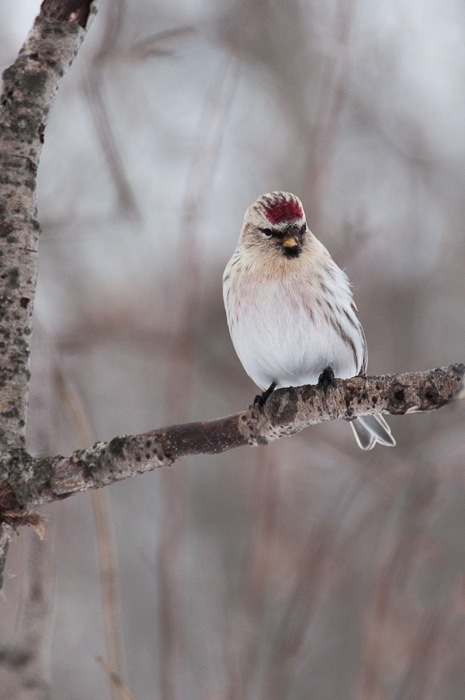 The Common Redpolls are here only during the winter and prefer the Arctic for summer playground. Hmmm, a hardy bird, that’s for sure. 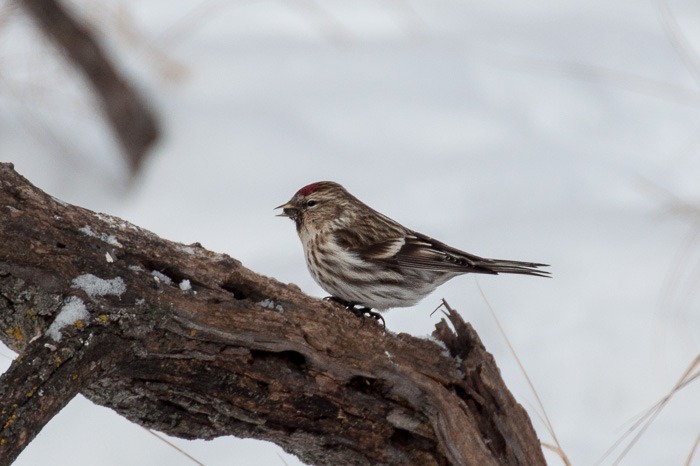 When here in Winnipeg the temperatures drop to around –20C, the Redpolls are out and about, just having fun, feeding and doing their usual stuff. Although the sound here has been amplified a bit, you can easily hear them when you are walking in the woods. You just need to listen and have the chance to have no kids or dogs in the vicinity. But last time, I had a surprise. 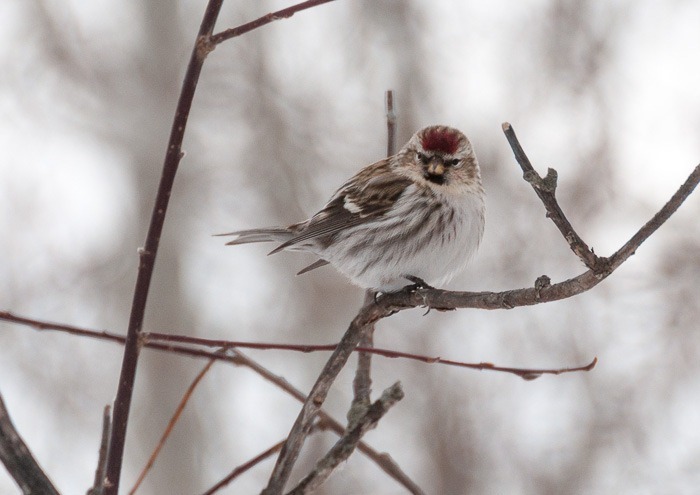 There was one Redpoll that didn’t look like a Common Redpoll. 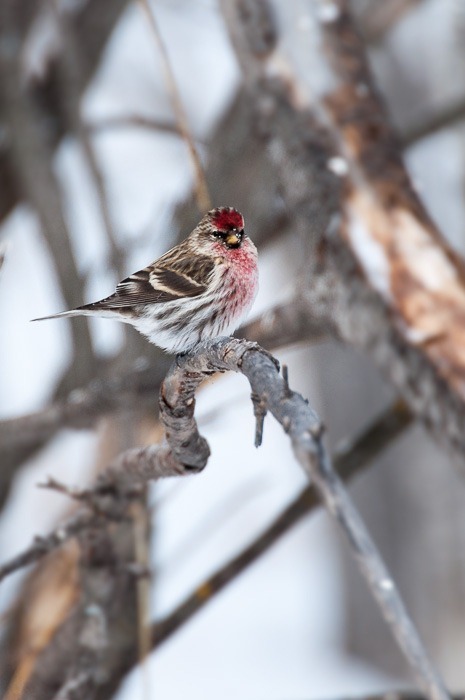 A rare sight in southern Manitoba is the Hoary Redpoll, very similar to the Common Redpoll, but way whiter and without the streaks on its sides. If you look close enough and from the correct angle, you can also see that the bill is a little smaller. But that detail doesn’t show in my photos here. 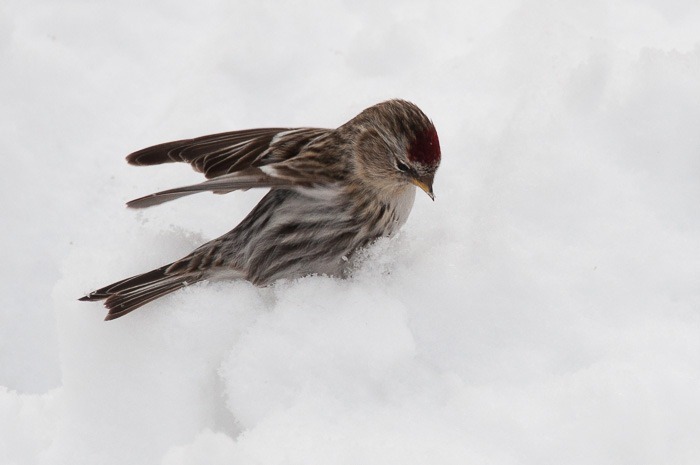 In fact, this was such a rare sight that I had to find help on our local forum where it was confirmed that this was a Hoary Redpoll and not a Common one. I am by no means an expert birder, I don’t even come close to the term “birder” but I do appreciate the different birds in the region. Enough to buy a bird book and trying to use it to identify the birds I shoot. 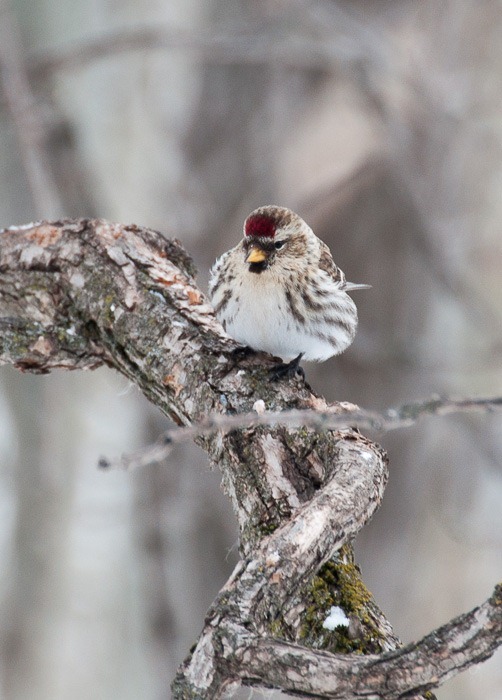 Also enough to go a bit crazy over some nice birds like the Redpolls. Expert help is always appreciated, though.